Kearns-Sayre syndrome (KSS) is a rare genetic condition caused by a problem with a person’s mitochondria, components found in all the body’s cells. Kearns-Sayre causes eye and vision problems, and it can lead to other symptoms, like heart rhythm issues. Usually, these problems begin in childhood or adolescence. KSS can be more broadly categorized with other types of rare mitochondrial disorders. These may have distinct but overlapping symptoms with KSS. The syndrome is named for Thomas Kearns and George Sayre, who first described the syndrome in 1958. The syndrome is very rare, with one study finding the rate to be 1.6 for every 100,000 people. People with KSS are usually healthy at birth. Symptoms begin gradually. Eye problems are usually the first to appear. A key feature of KSS is something known as chronic progressive external ophthalmoplegia (CPEO). KSS is only one of the types of genetic problems that can cause CPEO. It causes weakness or even paralysis of certain muscles that move either the eye itself or the eyelids. This worsens gradually over time. Another key feature of KSS is another condition: pigmentary retinopathy. This results from the breakdown of part of the back of the eye (the retina) that functions to sense light. This can lead to reduced visual acuity which worsens over time. Not everyone with KSS will get all these symptoms, however. There is a wide range in terms of the number and severity of these problems. Symptoms of Kearns-Sayre syndrome usually start before the age of 20. DNA is the heritable genetic material you get from your parents. Kearns-Sayre syndrome is a genetic disease caused by mutations in a particular type of DNA: mitochondrial DNA. In contrast, most of the DNA in your body is stored inside the nucleus of your cells, in chromosomes. Mitochondria are organelles—small components of the cell that perform specific functions. These mitochondria perform a number of important roles, especially with energy metabolism in your body’s cells. They help your body turn the energy from food into a form your cells can use. Scientists theorize that mitochondria derive from what were originally independent bacterial cells that had their own DNA. To this day, mitochondria contain some independent DNA. Much of this DNA appears to play a role in supporting their energy metabolism role. In the case of KSS, part of the mitochondrial DNA has been deleted—lost from the new mitochondria. This causes problems because the proteins normally manufactured using the DNA code can’t be made. Other types of mitochondrial disorders result from other specific mutations of mitochondrial DNA, and these can cause additional clusters of symptoms. Most people with mitochondrial disorders have some mitochondria that are affected and others that are normal. Scientists aren’t sure why the particular mitochondrial DNA deletion found in KSS leads to the specific symptoms of the disease. The problems probably indirectly result from reduced energy available to the cells. Because mitochondria are present in most cells of the human body, it makes sense that mitochondrial diseases might affect many different organ systems. Some scientists theorize that the eyes and muscles of the eyes may be particularly susceptible to problems with mitochondria because they are so heavily dependent on them for energy. Diagnosis of KSS relies on physical exam, medical history, and laboratory tests. 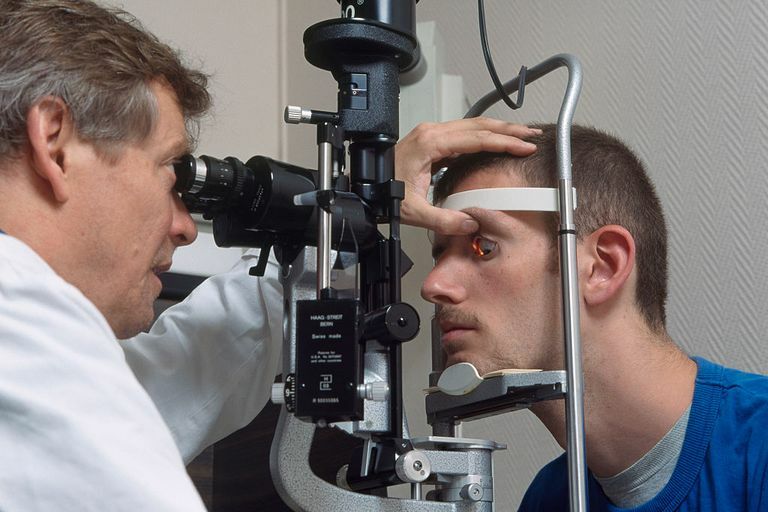 The eye exam especially is critically important. For example, in pigmentary retinopathy, the retina has a streaked and speckled appearance on an eye exam. Exam and medical history are often enough for a clinician to suspect KSS, but genetic tests may be needed to confirm a diagnosis. CPEO and pigmentary retinopathy must both be present for KSS to be considered as a possibility. In addition, at least one more symptom (such as heart conduction problems) must also be present. It’s important that doctors rule out other problems that can cause CPEO. For example, CPEO can occur with other forms of mitochondrial disorder, certain kinds of muscular dystrophy, or in Graves' disease. Diagnosis is sometimes delayed, partly because KSS is a rare disorder, and many general clinicians have limited experience with it. Vitamin treatments are also sometimes used for people with KSS, though we lack extensive studies about their effectiveness. For example, the vitamin coenzyme Q10 may be given along with other vitamins, such as B vitamins and vitamin C.
It’s especially important to work with your doctor to monitor for signs of heart problems with KSS, since these can sometimes lead to sudden death. Researchers are also working to develop new potential treatments for KSS and other mitochondrial disorders. For example, one approach centers on trying to selectively degrade affected mitochondrial DNA while leaving intact a person’s normal mitochondria. Theoretically, this might lessen or eliminate the symptoms of KSS and other mitochondrial disorders. KSS is a genetic disease, which means it is caused by a genetic mutation present from birth. However, most of the time, a person with KSS did not get it from their parents. Most cases of KSS are “sporadic.” That means that the person with the condition has a new genetic mutation that they did not receive from either parent. The child has some missing mitochondrial DNA, even though the mitochondria from their parents was OK.
Less commonly, KSS can be passed down in families. Because it is caused by a mutation in a gene found in mitochondria, it follows a different inheritance pattern than other non-mitochondrial diseases. Children receive all of their mitochondria and mitochondrial DNA from their mothers. Unlike other types of genes, mitochondrial genes are passed only from mothers to children—never from fathers to their children. So a mother with KSS might pass it on to her children. However, because of the way mitochondrial DNA comes from a mother, her children might not be affected at all, might be only mildly affected, or might be severely affected. Both boys and girls can inherit the condition. Talking to a genetic counselor can help you get a sense of your particular risks. Women with KSS may be able to use in vitro fertilization techniques to prevent the transmission of the disease to their potential children. This might use eggs from donors or donor mitochondria only. It can be devastating to learn that you or someone you love has a mitochondrial disorder like KSS. There is a lot to learn about this rare condition, and it may feel overwhelming at first. But many patient groups are available to help you connect with others who have experience with this or a related condition. These groups can help provide practical and emotional guidance and support. Fortunately, with the ongoing help of a medical team, many people with KSS can lead long and fulfilling lives. Khambatta S, Nguyen DL, Beckman TJ, Wittich CM. Kearns–Sayre syndrome: a case series of 35 adults and children. International Journal of General Medicine. 2014;7:325-332. DOI: 10.2147/IJGM.S65560. Lehman MD, McFarland R. Overview of approaches to mitochondrial disease therapy. Journal of Inborn Errors of Metabolism & Screening. 2018; 6: 1–7. DOI: 10.1177/2326409817752960. Magner M, Kolářová H, Honzik T, et al. Clinical manifestation of mitochondrial diseases. Dev Period Med. 2015;19(4):441-9. Mitochondrial DNA. Genetics Home Reference. NIH. Reviewed June, 2018. Shemesh A, Margolin E. Kearns Sayre Syndrome. [Updated 2018 Feb 21]. In: StatPearls [Internet]. Treasure Island (FL): StatPearls Publishing; 2018 Jan.